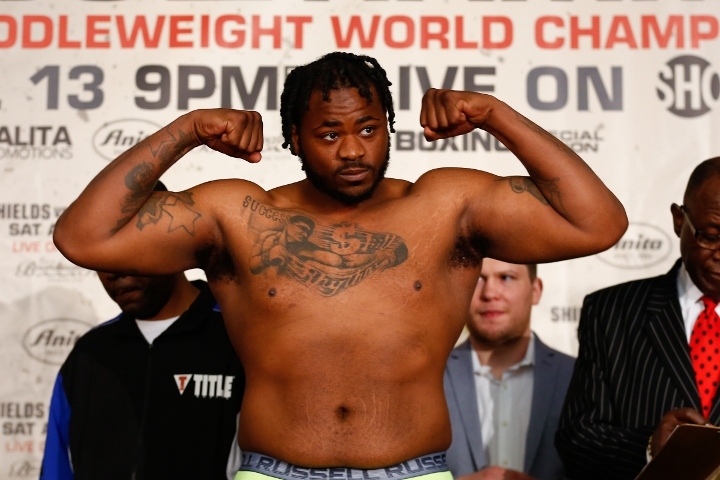 ATLANTIC CITY – Jermaine Franklin fended off Rydell Booker on Saturday night. Booker got off to a fast start in their 10-round heavyweight bout, but Franklin withstood some troublesome moments, made defensive adjustments and took advantage of a fatigued Booker in the later rounds to win a unanimous decision. Each of the three judges scored their fight for Franklin by big margins, even though Booker had some success, particularly in the first half of their fight at the Adrian Phillips Theater inside Boardwalk Hall. Judge James Kinney scored nine of the 10 rounds for Franklin (99-91). Judges Eugene Grant and Alan Rubinstein each credited Franklin with winning eight rounds (98-92) in the bout before Claressa Shields and Christina Hammer met in a women’s middleweight title unification fight. Franklin, a 25-year-old prospect from Saginaw, Michigan, improved to 18-0. He has 13 knockouts, but Franklin went the 10-round distance for a second straight fight. Booker, 38, didn’t box for 13 years before resuming his career in February 2018. The Detroit native, who previously lost only to James Toney, was incarcerated for most of the time when he didn’t box. He won three six-rounders in 2018, but the veteran took a much tougher fight against the younger, stronger Franklin. Showtime televised their 10-rounder as part of a “ShoBox: The New Generation” tripleheader. Booker was tired by the 10th round and didn’t do much during those three minutes. Franklin continued to press the action in that final round. Franklin and Booker boxed from a close distance early in the ninth round, and each fighter landed inside. A right uppercut by Franklin backed up Booker in the final minute of the ninth, but Booker quickly came back with a stiff jab. Booker caught Franklin with an overhand right early in the eighth round. Booker and Franklin viciously traded right hands after the halfway point of the seventh round. A right uppercut by Booker appeared to even lift Franklin off his feet. Franklin rallied later in the seventh, as he hammered Booker with head and body shots. Franklin kept coming forward during the sixth round, when he landed several right hands and caused Booker to tie him up sometimes. Booker and Franklin engaged in an entertaining exchange near a neutral corner during the second half of the fifth round. Booker also connected with right uppercuts twice in the fifth round. Franklin connected with two hard right hands early in the fourth round. Booker briefly held Franklin to keep the younger, strong fighter from coming forward. Franklin lost his mouthpiece for the second time in the fight late in the fourth round. Brown called for a brief break with 48 seconds to go in the fourth round, so that Franklin could put in his mouthpiece again. Franklin and Booker boxed against the ropes for some of the third round. They traded right hands several seconds before the third round ended. Booker blasted Franklin with two left hooks that knocked out Franklin’s mouthpiece just before the midway point of the second round. Franklin snuck in a left hook just before the second round ended. Booker countered Franklin with left hands twice during the first round. Later in the first round, Franklin landed an overhand right as Booker backed into a corner. Toward the end of the first round, Booker lunged forward and caught Booker with a left hook that backed up Franklin. Franklin is pretty suspect. I thought he was outclassed by Booker until age and conditioning caught up with Booker. Franklin is wide with his offense and open with his defense and he was hurt a fee times. Wtf!!!! Franklin lost!!! Booker countered that fool all night! Smh!! !